JK Rowling considered killing just about everyone at some point. "If there's one character I couldn't bear to part with, it's Arthur Weasley," Rowling has admitted. But she did originally plan on parting with the Weasley clan's father during Harry Potter and the Order of the Phoenix. That attack from Lord Voldemort's pet snake Nagini—which Harry creepily witnessed in his dreams–was going to kill Arthur in Rowling's original plan, but he survived mostly because he's such a good father. "You could make a very good case for Arthur Weasley being the only good father in the whole series," Rowling added. We're… not coming up with much competition. And REALLY SHOULD HAVE, TBH. These two adorable weirdos seemed perfect for each other, given their tragic pasts and shared interest in magical floral & fauna, and the Potter movie adaptations did hint at a romance. Rowling herself wasn't on board until well into the writing of Deathly Hallows, at which point she did start to feel "a bit of a pull" between the pair…. but not enough to commit. According to her more recent revelations, Neville eventually marries Hufflepuff's Hannah Abbott and Luna ends up with the grandson of Newt Scamander, who'll be played by Eddie Redmayne in the upcoming Fantastic Beasts and Where to Find Them. Of all Harry's Gryffindor classmates, Dean is one of the people we learn least about, but Rowling is well known for plotting out far more backstory than she used on the page. All signs point to Dean being muggle-born, but Rowling has revealed otherwise: "Dean's father, who had never told his wife what he was because he wanted to protect her, got himself killed by Death Eaters when he refused to join them." Dean knew none of this, and Rowling's original plan for Harry Potter and the Chamber of Secrets had him discovering his true heritage. This bombshell from Rowling inspired almost as many headlines as her revelation that Ron and Hermione might not have stayed together. Although she had planned from the beginning that none of the central trio would die, Rowling did go through a dark patch where she reconsidered. "I wasn't in a very happy place.. I started thinking I might polish one of them off, out of sheer spite," she said, while being interviewed by Daniel Radcliffe for the Deathly Hallows DVD release. "But I think in my absolute heart of heart of hearts, although I did seriously consider killing Ron, [I wouldn't have done it]." Talk about poetic justice. Given all the Dursleys' anti-wizard bigotry, it's hard to imagine a more fitting ending than their beloved son Dudley spawning one–and since Petunia's sister Lily was born to muggle parents, there's no reason the magical gene couldn't skip a generation. Rowling's original idea for the Deathly Hallows epilogue was a lot more detailed, and at one stage included Dudley showing up at Platform 9 3/4… with a magical child in tow. The reason she changed her mind? "Any latent wizarding gene would never survive contact with Uncle Vernon's DNA." Which is legit. A love triangle would have completely cheapened the central trio's bond, and we can all be grateful that Rowling knew better than to go there. But there were a lot of fans who felt Harry made more sense for Hermione than Ron… and though Rowling admits to being biased towards Ron/Hermione as "wish fulfillment," she sort of agrees. 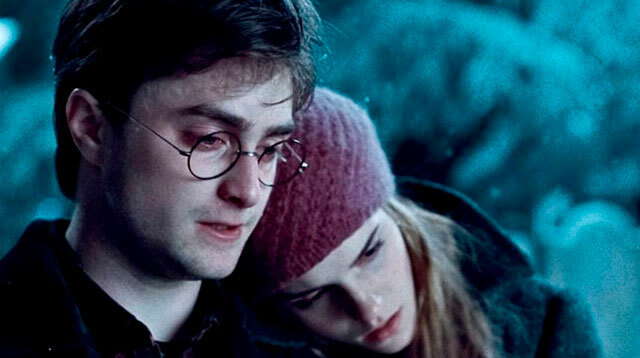 "In some ways Hermione and Harry are a better fit," Rowling told Emma Watson during an interview. "When I wrote Hallows, I felt this quite strongly when I had Hermione and Harry together in the tent!" It turns out that the film's screenwriter Steven Kloves had exactly the same feeling at exactly the same point in the story, and wrote the bittersweet dance scene that probably turned a lot of people over to the Harry/Hermione side. Of all the many, many fan predictions that were flying around the internet in between book releases, one of the most consistent was "Hagrid's going to die." Because he just seems set up for it, right? He's a wholly good character, he doesn't make the best decisions when it comes to personal safety, and he's so beloved by the central trio that his death would be genuinely crushing, which in the world of Potter means it's probably inevitable. Rowling has admitted that Hagrid was "a natural target", but she opted out of killing him because he was crucial to her mental image of the finale. Specifically, she knew all along that the climax of the final book would be Harry dying temporarily, and Hagrid carrying his lifeless body out of the Forbidden Forest–a throwback to the very beginning, when he brought baby Harry to the Dursleys. "That image kept him safe," she explains.